Halloween might be over, but pumpkins are still in fashion around my home and will be for a while. It’s hard not to fall in love with pumpkin flavoured things, especially when they’re all spiced up and studded with chocolate. 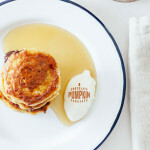 Pumpkin chocolate pancakes with whipped mascarpone is the perfect breakfast. Sometimes you just need pancakes. It might be because you’re hungry, you feel a treat, or because you managed to slice yourself so badly that you decide to head to urgent care because you’re too scared to look at your wound. I was halving an avocado, the dangerous way – in my hand – when my knife sliced right through the pit and into the base of my index finger. After the doctor glued my cut together (he said I managed to fillet myself), Mike kindly cleaned up my bloody avocado and offered to make me my heart’s desire in hope of cheering me up. I decided on french fries with lots of ketchup and sriracha, of course. And for dessert, I wanted pumpkin chocolate pancakes. I stress ate a whole batch of these pancakes, sans syrup. I just sat in front of the TV, my left arm throbbing from the combined pain of a tetanus shot and my 1/2 inch deep knife wound. My right hand was busy bringing pancakes to my mouth, no fork or knife needed. If you’re civilized, these pancakes make for a delicious sit down breakfast, but they’re also perfect for eating with your hands. They’re like extremely soft, fluffy, delicious pancake cookies. 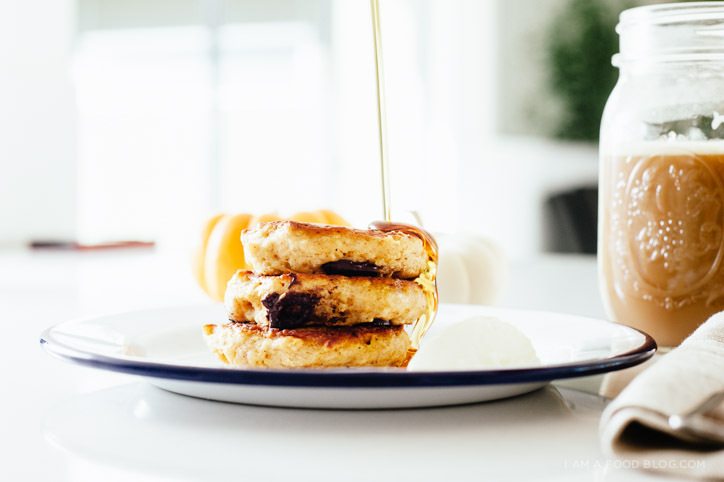 I hope you find the time to try these pancakes out – they are super delicious. And remember kids, always use a cutting board when halving an avocado. That means, the avocado goes on the board, not in your hand. Oh and that knife trick you do when you’re trying to get the pit out? Please, don’t even go there! I’m planning on cutting (ha!) avocados out of my life for a little while. In their place? 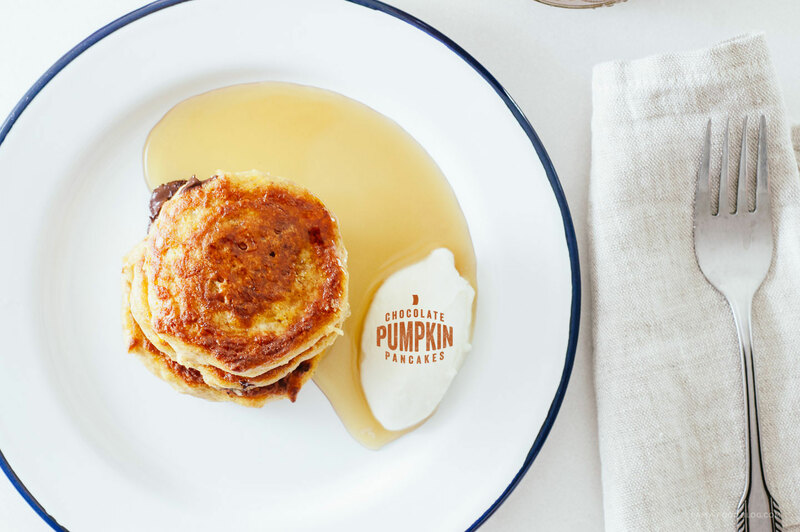 Definitely these pumpkin chocolate pancakes. Sift together the flour, brown sugar, baking powder, baking soda, salt, and spices. 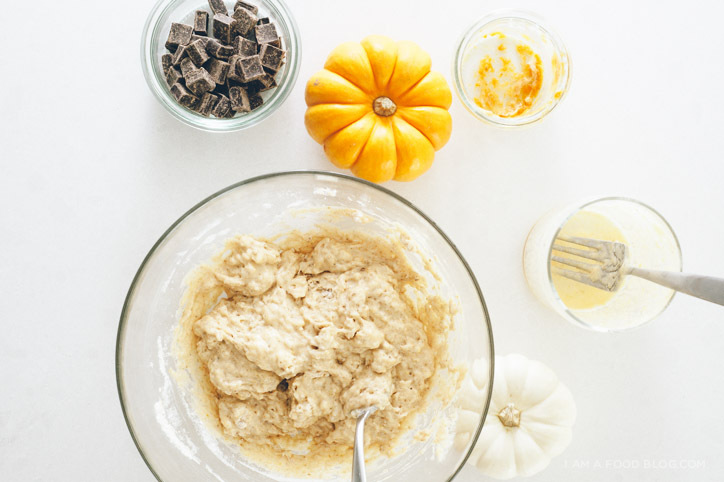 In a separate bowl, whisk together the buttermilk, egg, pumpkin puree and butter. Add the wet ingredients to the dry ingredients and mix until just combined – lumps are okay. 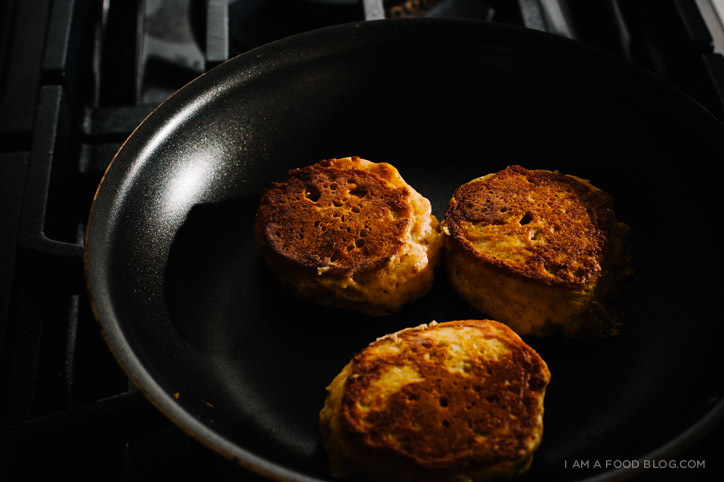 Heat up a non-stick pan over medium low-heat and brush with butter. Scoop the batter, using a 2 tablespoon measure. Top pancakes with desired amount of chocolate chips. Cook until small bubbles form and then flip. The second side doesn’t take as long – when golden brown, remove and transfer finished pancakes to a baking sheet and place in oven to keep warm. Continue until you are finished pancaking and enjoy warm with butter and syrup or mascarpone frosting, if desired. To make the frosting: fold the sugar into the mascarpone until well blended. Gently fold in the whipped cream. Ouch!! I’ve TOTALLY done the same while cutting an avocado and scared myself half to death, but thankfully a trip to Urgent Care wasn’t needed. It was enough to make me spoon the pits out of avocadoes for the rest of my life, though! Love the whipped mascarpone with these pancakes- the pumpkin and chocolate sound divine, but that cheese just elevates the whole dish! I am in high need of these. Pumpkin and chocolate are bff’s in my book! 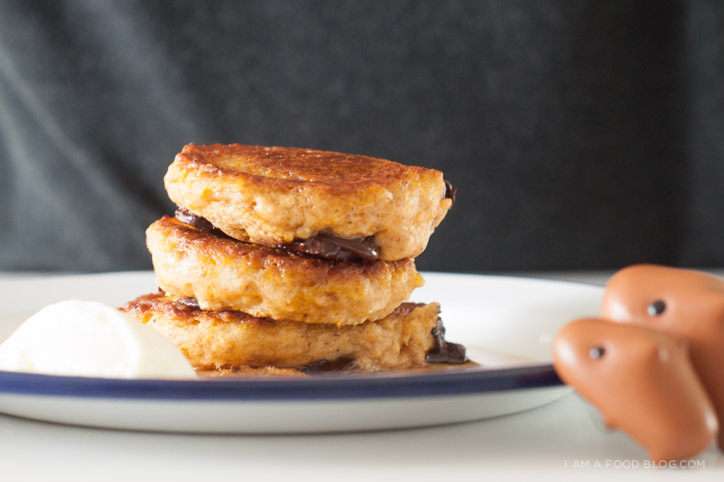 I’ve seen a fair amount of pumpkin pancake recipes recently but this one looks absolutely out of this world. Your blog always makes me so hungry! Must be something in the air lately. Last night I cut my fingertip off making breadcrumbs for your fennel pork meatballs, actually. Through the fingernail and everything. I soldiered on because there was no way I wasn’t going to finish those meatballs, dammit. They were delicious. And my finger eventually stopped bleeding. I think. Damn! Sorry about your finger. These pancakes look insane, I can’t believe how tall each one is. Mike, what a guy. Feel better and thank you for shooting these for us despite your injury. I hope your finger heals quickly! I have to say I’m a bit relieved; at first when you wrote that Mike cleaned the bloody avocado, I thought he was planning on consuming it after cleaning it! 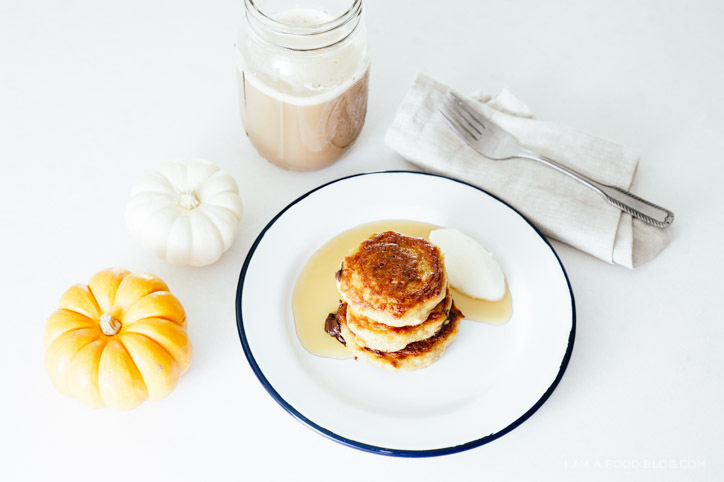 Learning about these pumpkin chocolate pancakes is a gift and a curse because I want them soo bad but am a horrible cook! What I do know is that next Saturday morning, I’m totally trying this recipe as pumpkins are still all the rage ha ha. This reminds me of pumpkin chocolate chip bars that I’ve had, the only thing that could make them better is cream cheese filling… YUM! Here it ishttp://kirbiecravings.com/2013/10/pumpkin-chocolate-chip-bars.html. I made these today and holy cow are they delicious!!!!! Literally always have trouble with pancakes, but these turned out perfect!